For a while, I was (very) upset with ads on my tablets (android and ipad). And unlike browsers on my windows (firefox or chrome) I could not find something like adblock for ipad. Therefore I decided to setup a squid on my synology ds210j and to setup an adblock like in squid. -install ipkg (see here for an how to, in french sorry). note : you can use the dns_nameservers directive in squid.conf to use specific dns servers (i use opendns). As seen in article 19 (a platform game), I had came up with a text file format which I used to create levels. 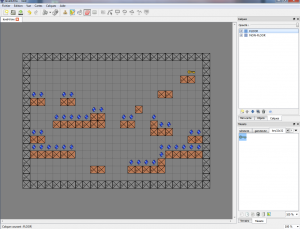 I was about to start coding a level editor when I came on this editor : http://www.mapeditor.org/ . This is freeware and it seems active enough. Note : a nice thread here around possible tile editors. I decided to use it with my current game project (a platform). I choose the xml format (tmx format). See an example here : level . I then had to code a method to parse the xml file. In the process I also completed the multi-tiles to one block trick to avoid the edge-catching bug. I also managed the texture tiling. A class to create level in a farseer world will come in a next article. 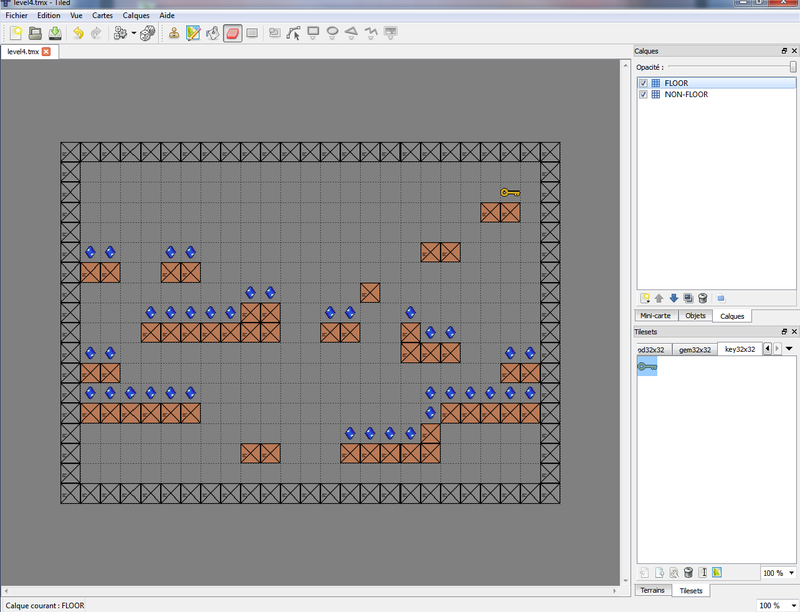 Here below a screenshot of a level made with Tiled. Here below a video playing this level. Farseer has one specific not always easy to deal with : your world is meant in KMS (kilo meter second) whereas your rendering is in pixel. Added to that, your world and rendering are two complete different things which does not make it easy to debug. This and a few other things like stats, datas, etc. A video to illustrate switching between rendering and debugging. In previous article, I have regularly used either a rotating sprite (a car, a rocket, a tank, etc) OR an animated sprite (a walking character). Here below these 2 classes. You can use them in as a quick start for a game so that you dont have to bother with this part. The animated class here : clsRotated . The rotating class here : clsAnimated . This time, lets add a zoom and rotating effect on our camera. And lets re use the rotated sprite class you may have seen in Article 12 – Pixel collision on rotated shapes. The only major change in the camera is the following where we will now use the position + rotation + zoom. In Article 16, we had animated a sprite. Now lets enhance the demo with a 2d camera following our character creating a simple scrolling effect. Note : a next article will cover parallax scrolling. We will simply had a camera class. XNA and FPE is nice to play with. This time lets start a platform game : an animated character jumping from one platform to another, collecting gems, in a wold of physics. For now, i create a circle for each tile instead of rectangles, it does mitigate (a lot) that bug : it is mostly invisible to the human eye (we see only the texture remember, not a body). 2-We want the character to jump only when touching the top of the tile, not the sides (or bottom). Also, we dont want the character to jump while in the air. There I have applied what seems the most common trick : a feet sensor, an extra body (not drawn) joined to my character (below) thru JointFactory.CreateWeldJoint. 3-The scenery is automatically generated from a text file (= a level) : level . A level editor could come later. Here how far I got so far with monogame and ubuntu 13.04. Remember I am not a linux boy. See previous article about monogame and windows.